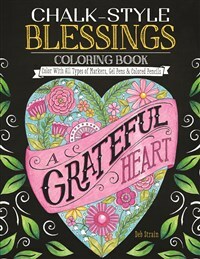 The faith-based art activities in this affirmative coloring book are packed with reassuring words, spiritual insights, and positive messages. Fill them with color to create your own inspirational chalk-art masterpiece. Acclaimed artist Deb Strain has been one of Moda Fabrics top designers for 19 years. She licenses her work on products from fabric to greeting cards, calendars, dinnerware, and figurines. Deb and her husband own Saltbox Wholesale, a business that distributes their Folk Art line of stationery products. She is the author of With Love from a Country Kitchen, and her art has appeared in numerous other books including A Grandma Is a Gift from God, Your Friendship Is a Gift from God, and Hope Will Light Your Way.